As compiled by Brainnewsradio.com – Your Global Online Newspaper. 1. Nairaland was Founded in the year March 2005 by Seun Osewa. 2. 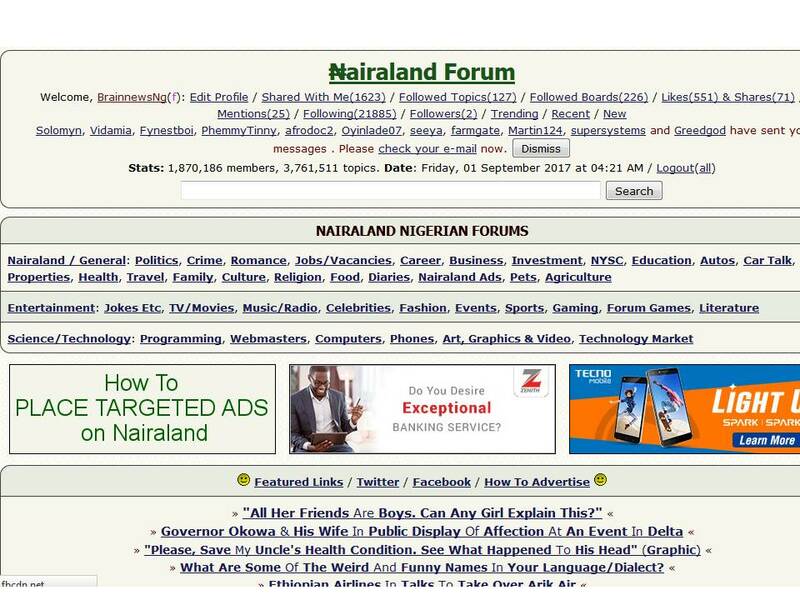 Nairaland is an online community (Forum) targeting at Nigerians. 3. Nairaland has 1,962,605 members, 4,089,986 topics as at Sunday, 18 February 2018 at 05:56 AM. 5. The site was developed by Osewa himself using Python Programming language. 6. The Site runs on a dedicated server (Cloud Flare). 7. The site alexa ranking as at September 1, 2017, 4:15 AM stood at 1,212 (Global) and 10 (Nigeria). 10. The site runs on an English script, with a green simple design. 11. Following a successful hacking attempt, Nairaland went offline briefly on the 22 June 2014. The hackers were able to get access to the website’s host server and backup, and maliciously deleted all its content. Three days later, it was back online after some data had been recovered from a remote backup. However, data from 10 January 2014 through the date of the attack was lost. 12. Nairaland was stripped off its position as Nigeria and Africa’s most visited website a ranking by Alexa. Nairaland’s position was taken by e-commerce site Jumia.com.ng which rose a lot of issues in February 2015. 13. The most popular users on the forum are Seun (Founder) and Lalasticlala (Super Moderator).